The Oklahoma Wildlife Control® Limited Liability Company IS a Certified Veteran Owned Small Business. In January 2001, Reginald started this wildlife control business in Marshall, Texas under the name of Texas Trap Supply … and soon after moved his family back to Tulsa, OK and renamed their business to OKTrap Supply & ADC. This is when he became involved with the Oklahoma Fur Harvesters Association and the First Oklahoma Trapper & Predator Callers Association. While assisting the Board Members of both previous associations, these two associations merged into a large single association now known as the Oklahoma Fur Bearers Alliance. Reginald has served as an O.F.B.A. Director from 2004 – 2009, & the O.F.B.A. webmaster from 2004 – 2011. Reginald is the current president of the Fur Takers of Oklahoma®, Inc. which was established in 2013 and he is an OK Licensed Hunter Education Instructor. 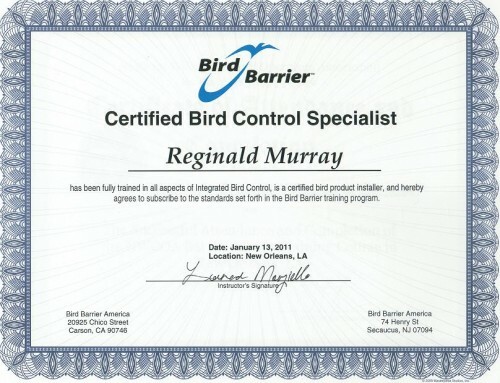 Reginald Murray holds the following additional certifications and licenses: Oklahoma State Licensed Nuisance Wildlife Control Operator, Licensed Professional Trapper, RRP Certified, Certified Bird Barrier Control Specialists, N.W.C.O.A. 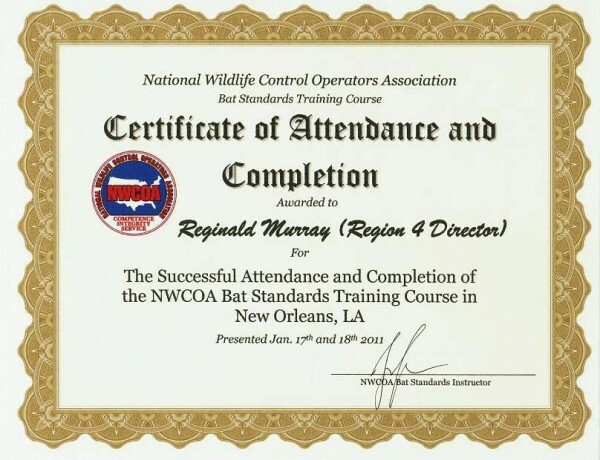 Bat Standards Certified, N.W.C.O.A. Basic Wildlife Control Operator Certified & Conibear Safety Training Instructor. Reginald continues to assist, teach and educate the general public and youth about modern wildlife removal, both in schools and the public. In 2008, Reginald & Jennifer restructured the OKTrap Supply & ADC business into Oklahoma Wildlife Control® Limited Liability Company. The restructuring has allowed Reginald and the rest of the service crew to concentrate more on their customers’ needs, and Jennifer to take care of Business Managements while learning more about the removal and exclusion procedures herself. The OK Wildlife Control®, L.L.C. Crews’ professional dedication to nuisance wildlife control, depredation control, exclusions & wildlife conservation is unrivaled. So don’t take chances, contact OK Wildlife Control®, L.L.C. today. Reginald Murray, personally, has more than 25 years humanely capturing, controlling, and managing wildlife populations … and addressing problems and issues in a professional manner. 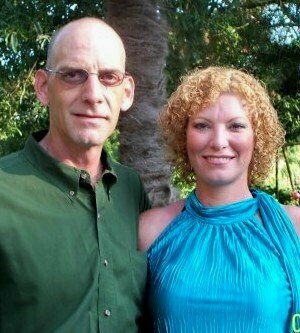 He ensures that the services provided by OK Wildlife Control®, L.L.C. are to his own standards, which in fact exceed most of the recognized, acceptable standards and practices throughout the country. 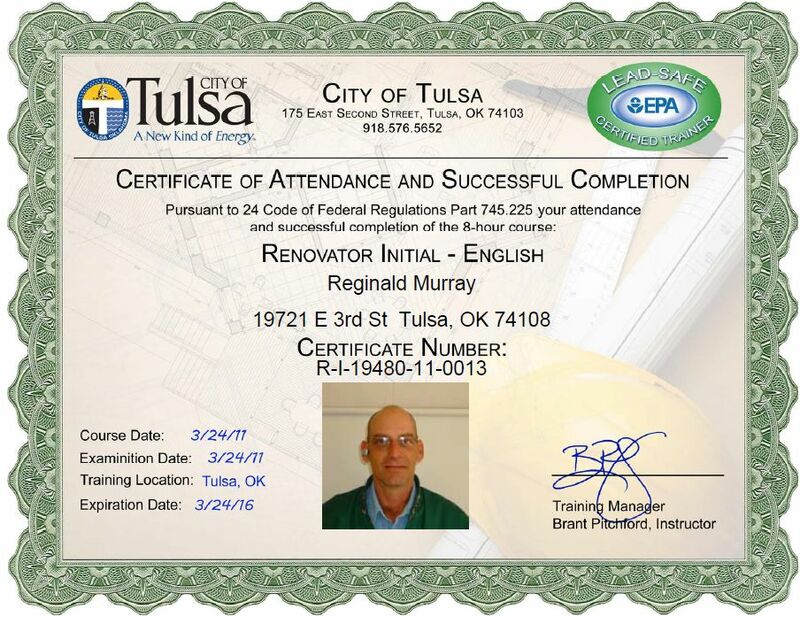 He assisted in the implementation of nationally recognized operations instruction which has been adopted by the State of Oklahoma as the new course curriculum required in order to obtain the state license. He has been published several times and has written instructional training programs that have been presented at several national industry meetings. H.S.U.S., O.D.W.C., and the A.V.M.A. Departments have in place recognized standards that are general and easily exceeded … very few in our industry, if any, could meet or exceed the standards that Oklahoma Wildlife Control® Limited Liability Company have in place for their clients and the wildlife. License issued by the same. * To resolve health & safety issues associated with humans & wildlife. * To ensure the most humane control methods available are in use to minimize wildlife trauma. * To properly educate and rebuke the misconceptions of wildlife control in the modern era. * To begin and end each job function with “Quality” in mind. ***As of the publishing time of this website, Reginald Murray has accumulated more than 25 years humanely capturing, controlling, and managing wildlife populations … and addressing problems and issues in a professional manner. He ensures that the services provided by OK Wildlife Control®, L.L.C. are to his own standards, which in fact exceed most of the recognized, acceptable standards and practices throughout the country. Based on his reputation, experience, professionalism and dedication to improving the wildlife control industry, Reginald was selected and appointed as the Region 4 Director for the National Wildlife Control Operators Association in 2010, as he was elected as the OK State Chapter Vice President of NWCOA in 2009.